Flemish-Dutch theatre artist Jan Fabre is considered one of the most innovative and versatile artists of his day. Over the past twenty-five years, he has produced works as a performance artist, theatre maker, choreographer, opera maker, playwright, and visual artist. 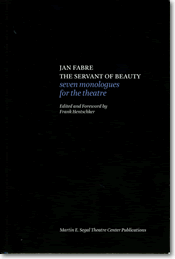 This volume of monologues is the second collection of works by Jan Fabre for the theatre in an English translation. Fabre, born in Belgium, is a total theater artist: writer, director, designer, and choreographer. Includes: We need Heroes Now (2010), Little Body on the Wall (1996), The Emperor of Loss (1994), She was and She is, Even (1975), and others.